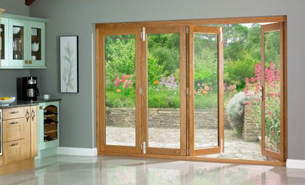 very few additions to your home can add such a dramatic transformation as bi-folding doors. the versatility and flexibility they provide can transform almost any living room, bedroom, kitchen or conservatory with their ability to provide glazed panoramic views and unrestricted access to your garden, patio or terrace. our bifold doors offer impressive opening apertures that blur the internal and external spaces, creating unique living and social areas. the ability to effortlessly open up an entire wall as part of your home, conservatory or orangery and flood your surroundings with light and air, maximizing your total living space, will make the most of a beautiful view and bring the outside inside your home. however the large span of glass does not compromise the thermal performance of your home, and the incorporation of highly engineered thermally efficient frames and glazing allows you to enjoy the views all year round with a warm home and low bills. 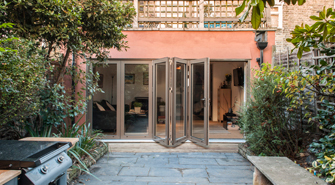 available in a range materials, styles and designs, the bi fold doors can be stacked inside or outside the room, to the left, right or split to stack on both sides. designed and manufactured inhouse by vellacine, each and every door is custom made and manufactured to your exact sizes and chosen sliding/bifolding configuration. every door we manufacture is high quality, high performance and high security with multipoint locking systems and security glass. whether you chose aluminium or timber-hybrid, our bifold doors will give any project a stunning contemporary feel merging the inside and outside environments together creating an extra living space dimension. 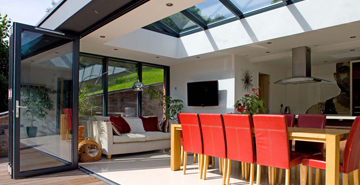 vellacines expertise in providing home glazing solutions since 1978, combined with our products exceptional weather and thermal performance, is your guarantee our bifold doors will continue to operate effectively and efficiently whilst delivering your family energy bill savings well into the future.